The Pro12 will be played during next year's Rugby World Cup [RWC] despite the English Premiership putting their league on hold. Elite matches are not allowed be played in the host country of a World Cup during the tournament, affecting the English top flight. Wales will stage eight World Cup games but the Pro12 will continue during the tournament. "We will be playing matches during the RWC," Pro12 director David Jordan said. "We will obviously have to organise matches to take account of the use of the Millennium Stadium for RWC pool matches." Cardiff's Millennium Stadium will host six pool matches, including two Wales matches, and two quarter-finals. Hosts England face Fiji in the opening game on 18 September 2015 at Twickenham, which will host the final on 31 October. 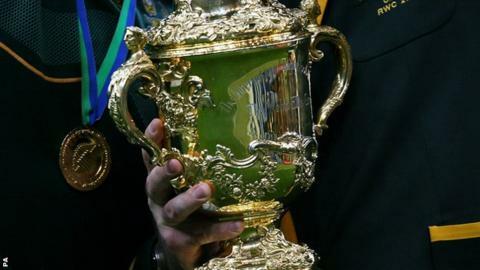 The Rugby Football Union [RFU] and English Premiership clubs are close to a financial compensation deal for their lack of income during the World Cup. The English schedule will put question marks over the Anglo-Welsh development tournament, the LV Cup, being played next season.